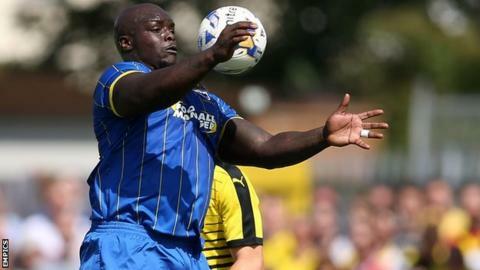 Goals from Adebayo Akinfenwa and Andy Barcham gave AFC Wimbledon their first win of the season at the expense of Crawley Town. The hosts took the lead when Gwion Edwards headed home Luke Rooney's cross at the back post. Akinfenwa headed in a Barcham cross after the break to level the scores. Barcham, who earlier forced a fine save from Freddie Woodman, won it with another header after George Francomb's shot was blocked. "I wanted to see whether we could recreate the Plymouth game in the first half. "I needed to find out whether they could recreate that because that's how I imagined it and we didn't, we clearly didn't. "Straight away I had a brave decision to make. It was a simple one to change it around and unfortunately Tom (Elliott) was the one that made way, it could have been anyone at that point. "There is no point having a player like Bayo Akinfenwa and not playing to his strengths when the time is right." "I thought we dominated the first half and were excellent and they dominated us second half and a couple of mistakes and a couple of bad goals we conceded. "We are obviously not pleased, we're frustrated and we wanted to make this place a fortress starting today. We have a chance to make it right on Tuesday night. "I'm just disappointed for the players and the staff and the supporters." Match ends, Crawley Town 1, AFC Wimbledon 2. Second Half ends, Crawley Town 1, AFC Wimbledon 2. Attempt blocked. Adebayo Azeez (AFC Wimbledon) right footed shot from the right side of the box is blocked. Attempt saved. Sean Rigg (AFC Wimbledon) left footed shot from the right side of the box is saved in the bottom left corner. Barry Fuller (AFC Wimbledon) wins a free kick on the right wing. Foul by Bryan Van Den Bogaert (Crawley Town). Substitution, AFC Wimbledon. Sean Rigg replaces Adebayo Akinfenwa. Substitution, Crawley Town. Lewis Young replaces Simon Walton. Attempt saved. Adebayo Azeez (AFC Wimbledon) left footed shot from the left side of the box is saved in the bottom left corner. Gwion Edwards (Crawley Town) is shown the yellow card. Goal! Crawley Town 1, AFC Wimbledon 2. Andy Barcham (AFC Wimbledon) header from very close range to the top right corner. Assisted by George Francomb. Attempt missed. Gwion Edwards (Crawley Town) right footed shot from the right side of the box misses to the left. Lyle Taylor (AFC Wimbledon) is shown the yellow card. Corner, AFC Wimbledon. Conceded by Freddie Woodman. Attempt saved. Jonathan Meades (AFC Wimbledon) right footed shot from the centre of the box is saved in the bottom left corner. Attempt saved. Andy Barcham (AFC Wimbledon) right footed shot from the centre of the box is saved in the top right corner. Simon Walton (Crawley Town) is shown the yellow card. Attempt blocked. Jake Reeves (AFC Wimbledon) left footed shot from the centre of the box is blocked.